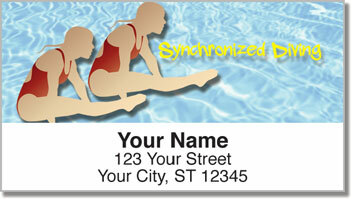 This isn't like doing cannonballs off the high-dive at your neighborhood pool! The sport of diving requires both strength and grace as well as good old fashioned guts! Divers fall 10 meters into the water while twisting, tucking and turning in mid-air. It ends with the perfect entry and nothing but the tiniest splash. 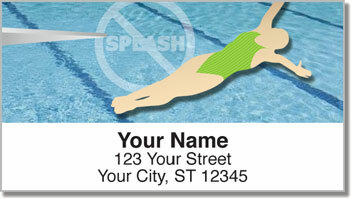 Whether you are amazed by the acrobatic skills of Olympic divers or actually practice the sport yourself - these return address labels make a unique finishing touch for your letters and packages. Use this handy product to save a ton of time. 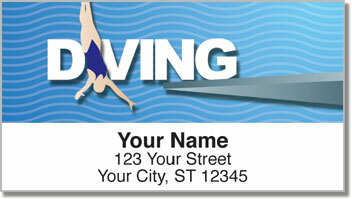 A self-adhesive backing means all you need to do is peel and place a label on every envelope. 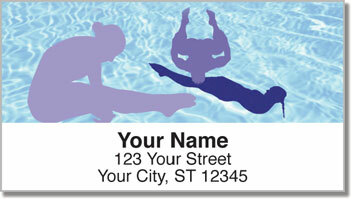 Get your very own Diving Address Labels today! Order them with matching personal checks.